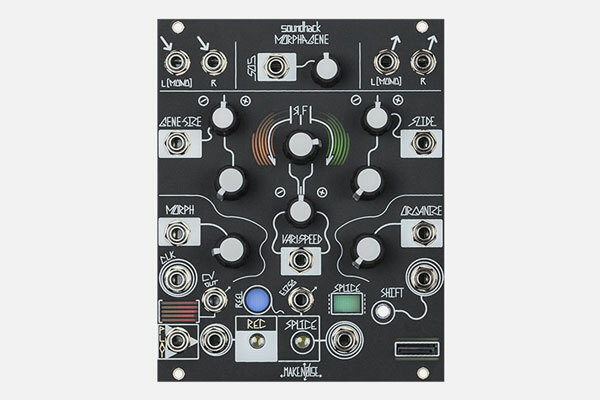 The Morphagene is a next generation tape and microsound music module that uses Reels, Splices and Genes to create new sounds from those that already exist. Search between the notes to find the unfound sounds. A few of the Morphagene's most basic use: splice recorded audio and jumble it using ORGANIZE. Manipulate playback speed and direction with Vari-Speed. Granularize with Gene-Size and Slide. Layer or Stagger Genes using MORPH. Undertake iterative music processes by recording manipulations and overdubs into new Splices, like having two machines (one for Playback and modulations, one for Record). Process sound in real time using Time Lag Accumulation. Stretch and squash sound with Clock input.